The Yanks finally gave their fan base what they have been clamoring for all year: a convincing win against an inferior opponent. After dropping another series to the Rays in Tampa, the Bombers traveled home to open a four-game set against the dreadful Kansas City Royals. Not to get excited about beating a team forty games under .500, but the Yanks needed to go out and take care of business against one of baseball’s bottom-dwellers. The Yanks went to work early, jumping out to a 2-0 lead in the bottom of the first. It started with Aaron Judge taking a ball off the hand from Royals starter Jakob Junis (more on this later). Didi Gregorious followed with a double down the right-field line to put runners on second and third with one out. Giancarlo Stanton brought home Judge with a Sac-Fly and Gregorious came home on a fielding error by shortstop Adalberto Mondesi. Austin Romine would increase the lead in the bottom of the fourth inning when he doubled home Neil Walker, giving they Yanks a 3-0 lead. Mondesi would make another error, putting runners on the corners with two outs. Did would make the Royals pay, parking a three-run home run to right field, thus increasing the lead to 6-0 after four innings. The bottom of the fourth was noteworthy for another reason: Miguel Andujar pinch-hit for Judge. After being hit on the hand in the first, Judge stood in the game and actually got an infield hit his second time up. However, the pain and swelling would not go away, and Judge would eventually come out. He went to the hospital to get an MRI, which is concerning since there is an x-ray machine at Yankee Stadium. It goes without saying how important Judge is to this team. Not only has he been the most consistent player all year, the 2017 Rookie of the Year is one of the leaders of the team and is adored by his teammates. All the Yankees and their fans can do now is hold their breath and hope for the best. 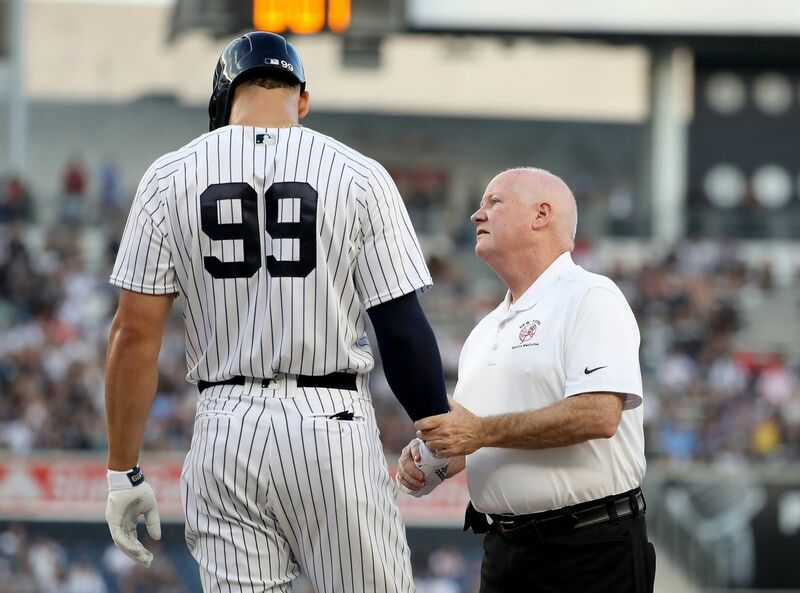 (Update: Judge has a chip fracture in his right wrist and won't be able to swing a bat for three weeks; not the best news, but could be worse). A positive for the Yankees tonight was that Sonny Gray actually pitched well at home. Granted it is the Royals, but Gray needs his confidence back and tonight was another step in the right direction. Gray went five innings giving up zero runs on three hits, walked two and struck out five. He got into some trouble in the bottom of the third, but struck out Mike Moustakis with the bases loaded. The Yanks faced another injury scare as Gray was hit on the hand with a comebacker in the fifth. He stood in the game and battled through the inning, but that would be it for him. He was smiling in the dugout, so hopefully he was removed as a precautionary measure. Gray has been awful for most of the year and the Yankees just traded for All-Star J.A. Happ to sure-up the rotation. If Gray can continue to pitch well, a Severino, Tanaka, Happ, Sabathia, Gray rotation is very solid for the stretch run. They Yanks tacked on a run in the bottom of the fifth with a Greg Bird Sac Fly to left, making the score 7-0. Adam Warren would come in relief for the top of the sixth and proceed to give up a ground-rule double to Moustakis and then a two-run home run to All-Star Salvador Perez. Warren would get through the rest of the sixth. Starting in the seventh, we got a little taste of how nasty this bullpen is going to be. David Robertson came on and struck out the side with a single by Whit Merrifield mixed in. Then, the Yankees new acquisition, Zach Britton, made his debut and pitched a one, two, three eight inning. Green, Holder, Robertson, Betances, Chapman, and now Britton; this bullpen is ridiculously filthy. Thank you very much Brian Cashman. Chasen Shreve came on to pitch the ninth and got into some trouble. However, Aaron Hicks gunned down Alex Gordon at the plate to end the game and give the Yankees the 7-2 Victory. Game two of the four-game set takes place tomorrow night in the Bronx as C.C. Sabathia (6-4, 3.51 ERA) matches up against Brad Keller (3-4, 3.20 ERA). The Yankees have three more games against Kansas City and then two against the Orioles before heading off to Fenway to play four against the Red Sox. If they don’t win at least five of six on this home stand, that is a major disappointment.